Technical services are guidelines and counsels that Technical Support Department provides to customers. The services include quality checking of raw materials used to do concrete mix and concrete quality, checking working conditions of front work, checking general conditions of plants and machines used in concrete work. The philosophy that SCCC held to provide technical services to our customers is good service with reliability in order to reach satisfaction of our clients. 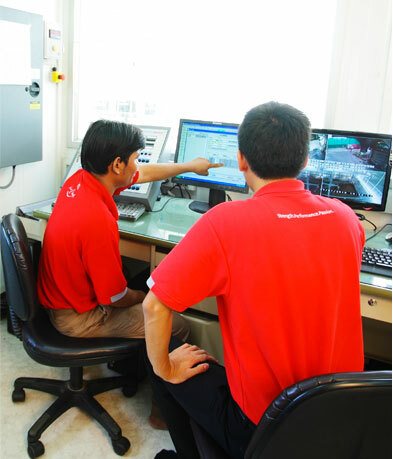 Checking conditions of plant and front-line production are the leading step of technical services, which directs to other technical supports. 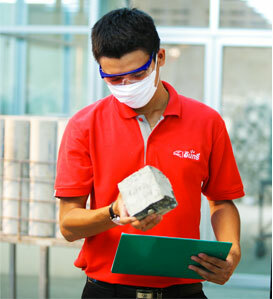 The main tasks of this service are checking raw materials used, production process, machines, and delivery of products. This technical service is provided to customers who want to control and follow-up quality of raw materials used in production process such as cement, sand, rock, water, and concrete admixture. This service was set up to help customers who want to develop new concrete mixtures that can be used efficiently. Besides, it is a way to adjust concrete proportion, which results in reducing the cost of concrete. The purpose of this service is to encourage and support SCCC’s clients to use the products appropriately and effectively. This service was generated as the result of rapid new developed construction materials in the market. Thus, for the clients and users of SCCC to work and use the materials effectively, the technical support team was created. This service assists our clients and our users to cope and work with new technologies that involve with production and construction works systematically and efficiently.